Romitaman Original Comic Book Art :: Private Collection :: Amazing Spider-Man 247 Cover (1983) SOLD SOLD SOLD! by artist John Romita Jr.
Click Here To See Amazing Spider-Man #247 Comic Book! Click Here To See Extra Vellum Spider-Man Inked Artwork Which Is Included With Cover!! Check out this very nice 1983 AMAZING SPIDER-MAN cover which was penciled by the great John Romita Jr., and inked by the great John Romita Sr., from the story titled: "Interruptions!" This cover 1 of the VERY RARE TIMES When father and son worked together on an AMAZING SPIDER-MAN cover! 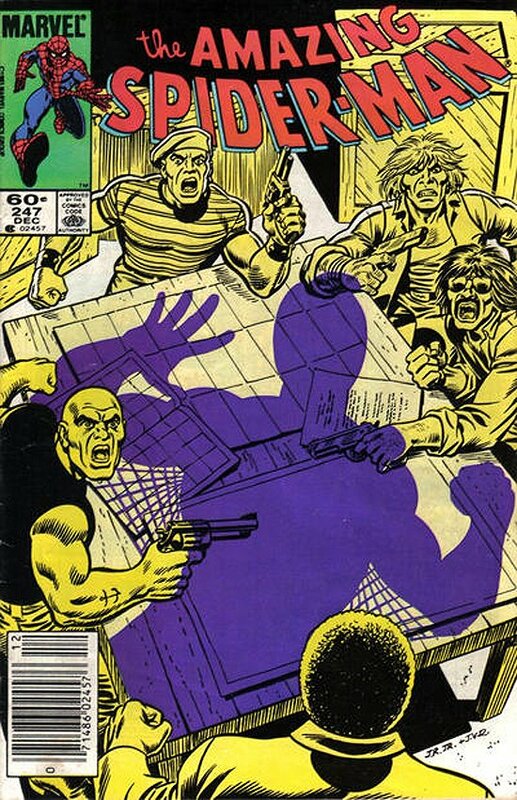 This nice cover features 5 thugs in their hideout freaking out as the SHADOW of Spider-Man descends down on them! 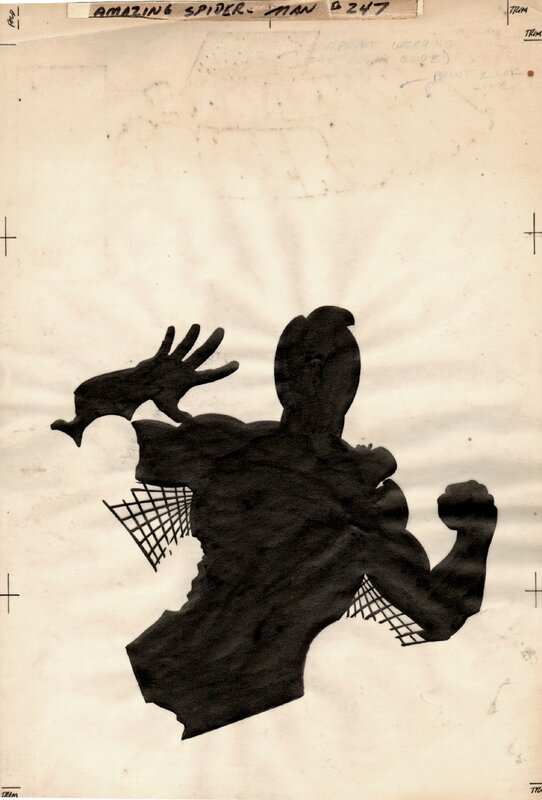 The shadow on this cover is actually an acetate overlay with the FULLY INKED BLACK SPIDERMAN by John Romita Sr. was drawn on a separate Vellum overlay! 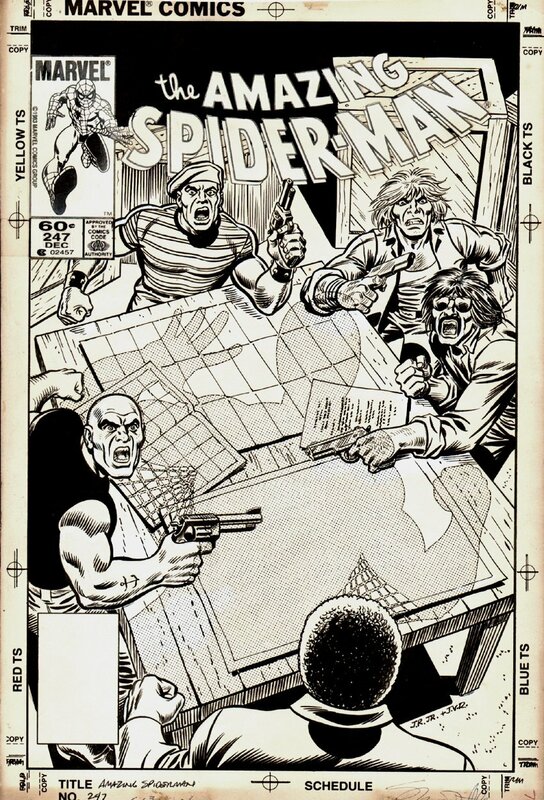 Click the red link above to see the FULLY inked cover sized Spiderman Image which is included with this VERY key very early ASM cover by Romita Jr! Compare this nice cover art to the published comic book in the red link above! ALL HIGH end pieces of art, including this one, are able to be purchased with VERY fair time payment plan options, and trades are always considered towards this and "ANY" art on our website! Just send us an email to mikeburkey@aol.com and we can try to work something out.